The death toll is destined to rise: thousands are missing feared dead. Rescue teams race against the weather and lack of heavy equipment or machinery. President Widodo: "Priority to save the missing". The displaced persons are over 17 thousand. They have found shelter in at least 24 centers set up in military bases, churches, schools and other open spaces. Jakarta (AsiaNews) - The Indonesian government is appealing for international aid to cope with the emergency caused by a series of devastating earthquakes and a tsunami on the island of Sulawesi, where at least 832 people were killed: 11 in Donggala and 821 in Palu, capital of the Central Sulawesi province. The authorities say the death toll is set to rise and announce mass burials, in a desperate attempt to prevent the spread of disease. A first earthquake, of magnitude 7.4 with its epicenter 27km away from the city and at a depth of 10km, struck Donggala at 18.02pm on the evening of three days ago. A few minutes later, another 5.9 magnitude earthquake hit Palu. The two shocks caused waves of up to 3 meters that devastated Talise Beach and the Donggala coast between 18.22 and 18.36. Rescue teams struggle against time and the lack of heavy equipment or machinery to rescue those still trapped in the rubble. It is feared that there are 60 people blocked under the Roa Roa Hotel in Palu, dozens of those hit by the collapse of several hotels and a shopping mall, hundreds of victims of landslides that hit the surrounding villages. The Indonesian government confirms that 1,200 detainees have fled from three detention centers, two in Palu and one in Donggala. In the latter, a fire caused all 343 prisoners to flee. 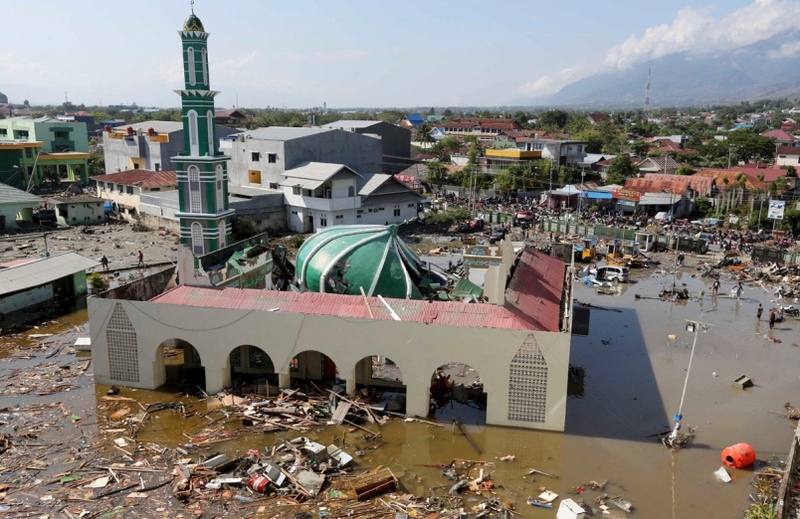 Indonesian President Joko "Jokowi" Widodo has reached the locations of the disaster along with military leaders and several government ministers. Widodo states that the priority is to save the missing. "The evacuation has not ended - he says - There are many places where it was not possible due to the lack of equipment, but it is coming. Several airplanes loaded with food will also come from Jakarta ". Wirabuana Hospital of Palu: 10 dead, 184 injured. Masjid Raya Hospital: 50 dead, Bhayangkara Hospital: 161 dead, Pantoloan Indouk Hospital: 20 dead, Kayumalue Pajeko Hospital: two dead. RS Undata Mamboro Palu: 141 dead, 160 injured. Woodward Hospital: 28 injured. Budi Agung Hospital: 144 injured. Samaritan: 54 injured.